I wanted to share with you some of the reasons, albeit some quite odd, that customers have told me they were put off by other Pet Businesses and came to me instead. This was information they gave freely, I never ask if they’ve contacted another business or why they stopped using a previous business, but thought it would be useful for those of you who may be losing customers and don’t know why or those just starting out. I’ve said it before and i’ll say it again, being your own boss gives you the freedom to pick and chose what you do, what you take on, when you work, BUT remember that seeming unreliable and taking days off regularly means the customer has to make alternative arrangements. You are entitled to days off but if it happens so often that the customer is constantly trying to find back up, they may just find someone more reliable altogether. Could be a controversial one but I have received a lot of enquiries simply because I was the only person in the area (at the time) who didn’t have DOG WALKER written all over my vehicle. While it’s good for advertising, customers have said they would rather not have it made so obvious that nobody is home except their dog. I would suggest a removable sticker or magnet so you can take it off if a customer requests. I always tell new business owners not to waste money on leaflets, instead spend that money on adverts in local magazines! I’ve received so many calls over the years from customers who told me they called me over other local businesses as they felt I must be serious about my job, professional and ‘legit’ because they’ve seen me in a magazine. While group walks are not ‘wrong’ in my opinion, a lot of dog owners do not want their dog socialising with dogs they don’t know or simply their dog isn’t that great with others and they’d rather the peace of mind in knowing their dog is on a lead being walked individually. If you offer group walks, maybe you could offer solo walks for anxious or reactive dogs as well. I’ve gained many customers because I offer solo walks. So important, especially if the potential customer doesn’t know you from adam. If someone puts a kiss at the end of their message, I tend to put one back! Now this may sound silly and petty but it mattered to the customer and got me the job over every other business they’d contacted! A simple x at the end of my message! Apparently I was the only person who did this and to the customer made me seem friendlier than the others she’d contacted! It’s hard to portray your personality in a written message but very easy to appear harsh, unfriendly and unapproachable so be careful how you are coming across. We may not always agree with how people feed or walk their dog and we may not choose to do the same with our own, but we need to respect how the customer chooses to care for their pet and respect their rules and instructions (as long as it’s not cruel or harmful to the animal). For example, I’ve heard so many stories of dogs running off because they’ve been let off the lead when the dog walker was asked not to, or the dog has been sick because the pet sitter gave them a treat they weren’t allowed. I’ve even been told of dog walkers who have taken their own dog to customers houses without permission which has ended in fighting and items in the house being ruined or broken. Believe it or not being too cheap can cause potential customers to assume you’re not professional or serious about your job! So don’t be scared to charge more or up your prices if you’re a lot cheaper than others in your area. So that was a quick round up and things to think about if you are loosing custom and don’t know why or if you are getting enquiries but not bookings. Could it be one of the reasons above? 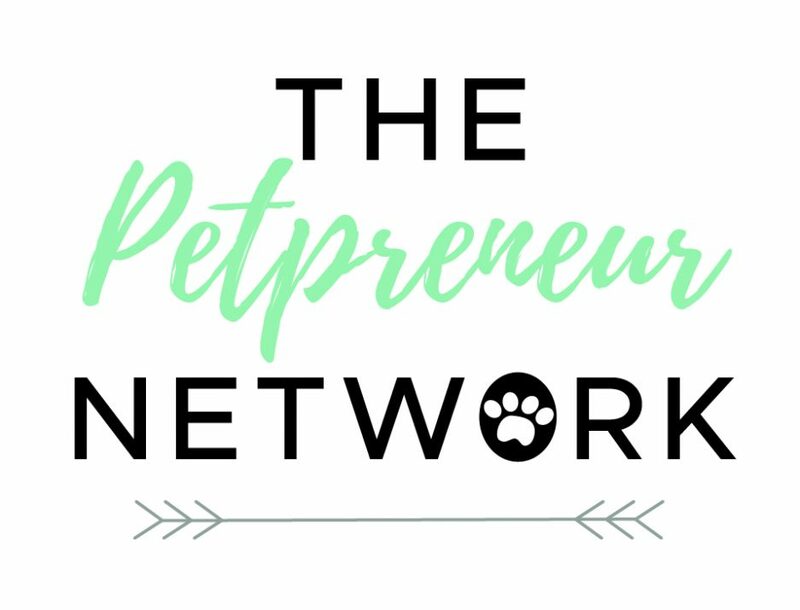 For more support and advice visit The Petpreneur Network, join The Facebook Group or follow us on Instagram! If you’re not earning as much as you’d hoped from your business, whether it be from walking dogs, grooming or cat sitting, there are ways to make the most out of your business and earn more. It’s not all about the money for most of us but we all have to make a living and pay those bills so here’s a few ideas for you! Is there something you can offer to the customers you already have? For example if you are a dog walker who does solo walks, could you offer a group walk at the weekend or when you’re less busy. If you’re a dog groomer could you offer a pamper session or canine massage? Or how about offering a ‘poop pick up’ service to help your customers keep their gardens clean! If you create a pet product could you expand on it or add something to it that your customers would pay a bit extra for? When I started I was adamant that I didn’t want to look after cats, so much so that my first business cards said ‘dog sitting’ rather than ‘pet sitting’. But you can earn a good chunk of cash from cat & small pet sitting, which usually will be morning and evening visits so doesn’t interfere with your regular dog walks. If for example you’re looking after 3 lots of cats for a week at £12 per day that’s an extra £252 a week! If you’re a cat sitter and not particularly comfortable with dogs, could you walk small dogs at lunch time or advertise that you’ll care for guinea pigs and fish too? If you paint dog portraits how about advertising that you can paint other pets too! Is there something else that you’re good at that you can do when you’re not out walking, grooming and sitting that you can link to pets? For example if you’re good at sewing could you make and sell doggy bandannas or jackets or if you’re amazing at painting could you create hand painted gifts for pet owners and animal lovers? Good at baking, you could sell dog friendly home baked treats. Employing someone to work for you can be a great way to earn extra cash without you having to do much at all. As long as you do it properly, get advice from an employment expert and or legal adviser, or even get a HR Company to do the hiring for you, it can be an amazing way to expand your business and help even more pets at the same time! Wanna know the secret to stress free and affective social media for your local business?? The very name SOCIAL media means interacting, chatting with, mingling, meeting, networking, getting to know…..
Too many of us forget this and think it’s the place for us to sell, pitch and entertain people. You are not here to entertain, your business pages are to showcase what you can do and to attract paying customers. I did a survey of my customers who contacted me on Facebook and they said the first thing they looked at and what pushed them to contact me was my positive 5 star reviews, they didn’t even look at how many likes I had. In fact most people who had contacted me through my fb Page had already been recommended by a friend. I rarely post more than once a day, sometimes I don’t post at all, and when I do it’s usually just a photo of a pet I’ve seen that day. Personally if I’m following an account that posts 10 times a day, I stop looking and loose interest in that page. You’re probably bored of hearing me say it now but I’ll say it again! Haha! 👉🏼 Provide amazing quality service for the people who ALREADY pay you, and they will do your advertising for you! Simple. 1000 likes does not mean 1000 paying customers. If your likers and followers are not converting to paying customers then they are not your target audience. For example if I get 100 likes from other dog walkers around the country, it’s nice of them to show support but they are never going to be paying customers. Are you over thinking? I see a lot of people asking about blogs but then saying they’re not very good at writing and don’t enjoy it.. well don’t do it then! If it’s not going to benefit your business and you don’t enjoy doing it, why stress yourself out? Really think before you post something… is this benefiting my business, is it attracting potential customers to pay me or is it showcasing what i offer? If no then it’s probably not worth posting. So what are some things you could be doing? • Introduce yourself, tell people about you and why you started your business, was there a story behind it? For some ideas of what you could be posting have a look at my 30 day guide. Social Media – are you missing the point? Do you ever have one of those days (or weeks) where you think what the hell am I doing, what’s the point, why is nothing going to plan, why am I bothering? Trust me we ALL feel like that at some point and it can be hard to get out of that state of mind when we work alone. I have had sleepless nights, I’ve cried, I’ve ranted at my loved ones and felt so frustrated with it all and forgotten what the point was and why i was working all hours. What I’ve learnt is to keep coming back to the point and the reason why I started my business. My goals and my aims and why I do what I do. I wanted freedom, I wanted to be my own boss, to help people, to work with animals, and to do something I’m passionate about. I didn’t want to work for someone else. When you’re feeling rubbish and like you’ve lost your way, come back to these sentences to remind yourself why you’re on this roller-coaster journey. You could even print them off and put them somewhere that you’ll see them every day. Here’s your chance to give an overview of what you offer and what you’re about. I’ve seen a lot of Instagram accounts that literally just say ‘Dog Walker’ which, ok, says what it is on the tin, but if you’re a customer looking for the perfect dog walker are you going to go for that person or are you going to lean towards the person who has made an effort to put a full description with something to catch their attention? You can add your website link, phone number, email address and any other info you think they’d need to contact you easily. Social media experts say you should post 1-4 times a day to grow your following. EEK! That’s a lot! I personally don’t think I can cope with 4 posts every single day but I aim for at least 1 a day. I think if you are forcing yourself to post 3-4 times EVERY day you’ll end up putting out stuff just for the sake of it which is boring and repetitive. Just don’t leave it weeks without posting anything as potential customers may assume you are no longer in business or not working. You’re simply drawing attention to yourself rather than trying to ‘sell’ yourself to them. You can use up to 30 so make the most of them! Everyone loves watching short video clips, so Insta stories are amazing! Post videos throughout your day and show everyone how much fun your furry customers are having. You can be really creative with these, there’s loads of options now to make your stories interesting, fun and stand out. Show YOU, your personality, so potential customers know who they are looking at. They are more likely to contact someone who they feel a connection with or that they can SEE. Don’t be another faceless Instagram account. Overall don’t post just for the sake of it, be funny, interesting, informative and creative with your photos! This is your chance to attract potential customers and show them why they should use your services or buy your products! I didn’t really know what I was doing when I started my business journey, I just knew what my reason for starting was and what my end goal was. I did however do a lot of research which has definitely helped me to carve out my business and make things clearer in my mind. 1. Look at other similar businesses in your local area, what are they offering, what do they charge, if you’re a dog walker/pet sitter which areas do they cover? This will enable you to come up with your pricing structure so that you’re not charging too much or too little. 2. Is there a gap in the market, something missing from all these other businesses that you could offer? You don’t want to just copy or go with what everyone else is doing because you’ll just blend in which is the one thing you do not want to do. Having a unique product or service is going to make you really appealing to customers! 3. Who is your ideal customer? Where would they be so that you can catch their attention, where would they go to look for your product or service? Knowing this is SO essential, if you don’t know who you are advertising to how can you know where or how to advertise? Its really important to be clear on these points so that you’re not just completely winging it and hoping for the best, and it will really help you to get some of the essentials clear in your mind.